Looking for a fun and engaging small group, whole group or partner activity to teach sight words? 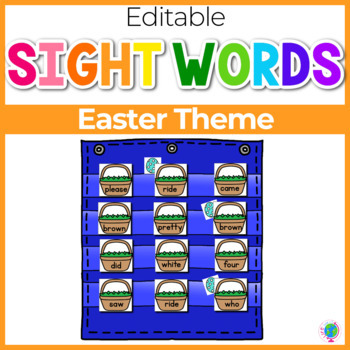 This Easter themed sight word hide and seek pocket chart game is the perfect way to work on sight words in preschool, Pre-k, and kindergarten. You choose the sight words to work on! With this editable file, you enter the words that you want to work on. 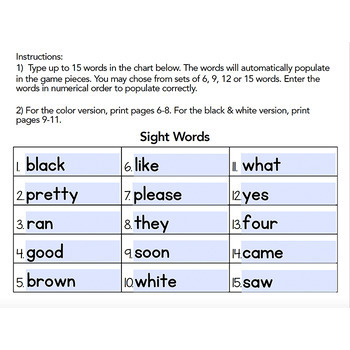 You can choose from sets of 6, 9, 12, or 15 words and any combination of sight words you want! Great for differentiating throughout the year! No need to install a font. **Please note that you MUST open the file using Adobe Reader or Adobe Acrobat. It will not work with Preview and may not work on other PDF readers. Adobe Reader is available as a free download. It also works great for CVC, CVCe, beginning blends and digraphs, or other spelling words. You can also use it for name recognition (up to 9 letters in a name). 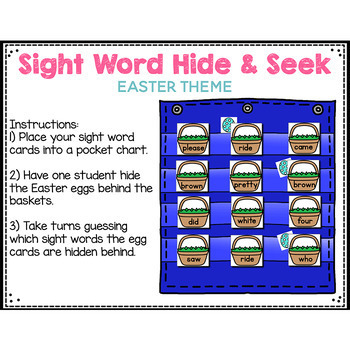 The Easter Theme Sight Word Hide and Seek Pocket Chart Cards are also included in the Sight Word Hide and Seek Pocket Chart Cards ENDLESS Bundle. One student will hide the Easter Eggs behind the Easter baskets and the other students will take turns guessing where the eggs are hiding. Optional differentiated recording sheets are included for additional practice with sight word recognition and writing skills. What is included with the Sight Word Hide and Seek Pocket Chart Cards? 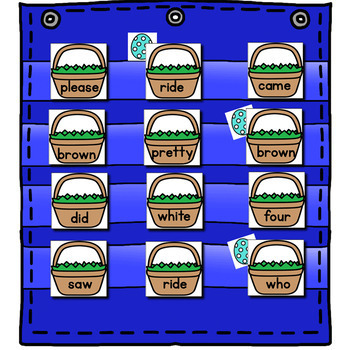 Place your chosen word cards into a pocket chart facing out, so that the students can read the words. Alternatively, you can place them on a table or floor if you do not have a pocket chart. Have the students (or one student if working in pairs) close their eyes while one person hides 1-3 pots of Easter eggs behind the baskets. Students then take turns guessing which sight word the Easter egg cards are hiding behind. The students cross off the words in the box as they are guessed. Then, they write the correct guesses in the boxes at the bottom of the page.